I liked the look of the Oeuf Sparrow crib from the first moment I saw it. It has a slightly vintagey feel but also feels very contemporary and modern. I like it’s clean lines and simple design. 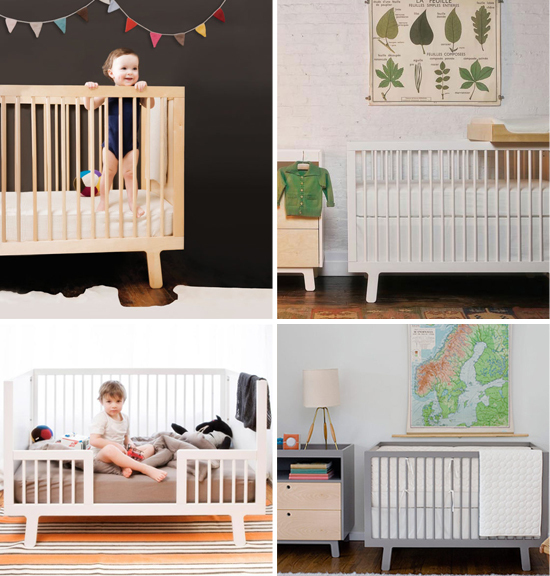 And as a toddler bed, I think this is the best-looking convertible crib I have seen. I also love the changing table attachment. We have a good changing station in our bathroom, but with all the changes you do with a newborn, I think we will end up having a changing station in the baby’s nursery as well, and this crib-top attachment would be perfect for that. The Oeuf Sparrow is also eco-friendly! So much fun with your crib week! Nice job and enjoy. I love Oeuf Sparrow and have now painted our big boys furniture to match the grey/taupe — love that color!